Making a to-do list (or five). Laying out a newsletter and/or a brochure. Responding to email (personal and work). Paying bills (personal and work). Spending time each day reading the Bible. Remembering to be thankful in all things. Finishing something (I’m a starter). 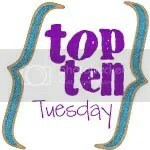 This post is linked to Oh Amanda’s Top Ten Tuesday. Glad I’m not the only one who hasn’t done either of those things… let’s do it by the end of the year! You and I are kindred spirits on #9. D. and I went to uslegalforms.com for our will. Then we had a notery friend noterize it. It was relatively simple, and VERY inexpensive compared to other channels. Smart lady… sad thing is, we have a lawyer in the family who I’m sure would help us… we just never ask. Sigh. This could be my list, too. Glad I’m not alone!